In an article published in Wireless World, December 1978, Ivor Catt published a criticism of the Maxwell displacement current that provoked considerable controversy. This article had a significant impact on my thinking as I had always had reservations regarding the displacement current concept in electromagnetic theory. In fact, the idea of displacement current that the modern textbooks present is completely different from Maxwell’s conception of it. Maxwell’s displacement current refers to the displacement of the electric particles of Maxwell’s aether. The fact that displacement current has survived despite the banishment of aether, as a result of Einstein’s special relativity, shows that displacement current remains an important concept in modern classical electromagnetic theory. Here I will discuss the problems and difficulties that the displacement current concept produces. 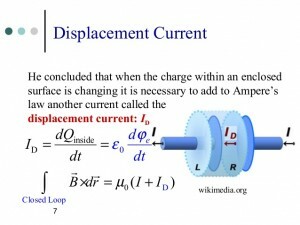 Probably the biggest difficulty in understanding the concept of displacement current has to do with the difficulty in understanding a concept that is a variation of the idea of an electric current, and that idea has its own set of problems as discussed in the essays regarding the Catt Question. To repeat what was discussed previously, electricity travels at light speed and so can not be composed of any material objects that have mass such as electrons. The Catt Question demonstrates that there can not be any material electron flow in a circuit, and so the entire conception of a displacement current, which relies upon the electric field inside of wires as its justification, is an unnecessary conception. On the other hand, once we have dispensed with a electron conduction current that flows inside of wires, there is a need for a non-material displacement current type concept to replace the now defunct conception of conduction current. The currently accepted textbook definition is clearly the starting point. The presently used textbook definition is easily identified and pinned down as it is illustrated in numerous diagrams that are available from an Internet search, such as the one to the right. The salient points of the definition are that as the conduction current dQ/dt enters the capacitor, there is an increase in the charge stored on the plates, so that the electric field between the plates in increasing and hence the electric displacement field, which is a measure of the quantity of charge located on the plates, changes according to the law Q=CV. The displacement current is defined as dD/dt so that there is a conservation of current according to i=dQ/dt=dD/dt. It is claimed that this change in displacement as a function of time, produces a magnetic field intensity H as follows: curl H=dD/dt. So the displacement current, which is only present inside the capacitor and between its plates, produces a magnetic field the same as if it were the conduction current. What is not fully appreciated is that this definition of displacement current depends upon the thesis that the current is thereby conserved within the context of a questionable definition of the conduction current. In other words, the entire scheme of displacement current, according to the modern textbooks depends upon the idea that an electric circuit depends upon an electric field to drive the physical electrons from the negative terminal of the power source through the connecting wires and around to the positive terminal. (See diagram at right.) In the case of a DC circuit containing a capacitor, the circuit is open or broken by the presence of the capacitor. Hence there can be no electron flow through the capacitor. The way this problem is avoided according to the textbooks is that there is a displacement current inside the capacitor that allows the circuit to be closed with respect to the flow of current. In other words the textbooks maintain that the conduction current and displacement current amount to the same thing as far as the magnetic effects and the continuity of circuit current are concerned. According to this interpretation, or model of the physics, the displacement current completes the circuit and hence the flow of current around the complete circuit. The current flows as long as there is a change in the electric field, and when the voltage across the capacitor equals that which is applied, the current no longer flows, and the magnetic field action stops. In the article published in Wireless World, which was referenced above, Ivor Catt and his coauthors Malcolm Davidson and David Walton dispute the standard textbook version of displacement current and present a different interpretation of the displacement current. Before discussing the details of this and the second Catt question, lets look at some of the conceptual problems that arise from the textbook version of displacement current. There are numerous difficulties involved in the standard accepted textbook account of displacement current. In the first place, the student has to be careful about the units and the definitions being used. A good example of an equation that is completely wrong is shown on the right. It shows an epsilon, permittivity, factor multiplied by dD/dt. What is meant is the electric field E not D. When the epsilon is removed the equation is correct. A second and related problem is that modern textbooks define the magnetic field as the vector field B, which is technically incorrect and confusing because B is magnetic field density. Hence the modern textbooks, for reasons beyond the scope of this essay, write the displacement current equations as shown in the first diagram on the top right above. Very few actual capacitors look like the capacitor used in the textbook diagrams and so they are atypical of actual capacitors and are actually a special case and so any results derived from them have no general applicability. Most actual capacitors are constructed by taking two metal foils and placing a insulator between them, and rolling the three layers up like a rug. Others use rectangular or square plates. Only the ceramic disk type resembles the textbook type of capacitor. Ivor Catt made a very important advancement in electrical theory when he realized that a capacitor is actually a transmission line and could be analyzed on that basis. Unfortunately this idea is unfamiliar to students and physicists because they are taught to think about a capacitor as in the diagrams above, as two circular plates, while a better way to think about it is as a transmission line as shown at the right. When we unroll the capacitor, we have two insulated parallel metal plates, just as in a transmission line. Before proceeding further, the reader should note that while the textbooks write the magnetic field as the B vector, they really should use the magnetic intensity vector H instead. Here we run into a problem that indicates that the quantities that are being used in electromagnetic theory have no firmly established accepted usage that is logically consistent. The use of the vector B, while the equations as written are correct, involves the introduction of the permeability constant, which obscures the physical interpretation. Here I will try to clear up the ideas involved as briefly as possible. The field vectors which are used are properly called E and H. These are the field intensity vectors and they are in units of volts per meter and amperes per meter respectively. They correspond to the measurable quantities of voltage and current. The vectors D and B are field density vectors and refer to quantities of the fields E and H and not to the intensities. So to simplify, the intensity vectors are equivalent to the concept of a force at a point, while the vectors D and B are measures of the quantity of the fields per unit area. This last statement is where the problems arise. It is best to think of the fields D and B as measures of the quantity of electricity at a location in space. Then to find the total quantity we integrate the field density vector over a surface that surrounds the location that we seek to find the quantity that it contains. Hence when we integrate the field D we get the charge that is inside of the integration surface. That tells us the quantity of charge that is contained within the surface. 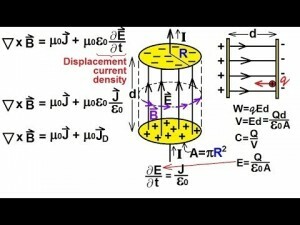 This explains the strange diagrams that accompany the discussion of displacement current in textbooks such as the one shown above and to the right. The title of this section, The History Of Displacement Current, echos the title of an article published in Wireless World, March 1979, by Ivor Catt, Malcolm Davidson, and David Walton as a follow on to the first article referenced at the beginning of this essay. It gives more detail regarding their concept, which modeled a capacitor as a transmission line, and how that approach led to a new view of the displacement current which dispensed with it as an unnecessary concept. In other words the displacement current was rendered unnecessary in the argument that was presented in the article. Unfortunately, for a purist, the article doesn’t give the correct historical facts regarding Maxwell’s discovery of displacement as well as Heaviside’s role in the story. This can be excused when we take into consideration that the purpose is not to give an accurate historical account, but to contrast the textbook accounts, against the revised conception of EM theory that was developed by the writers. Hence, what the article actually does is give an account as if the textbook accounts were historically accurate. We know they are not, and so this particular issue is not a mark against Catt and his coauthors, but an example of bad science history perpetuated by the textbook writers. The reader of The History of Displacement Current should take note that at the bottom of page 42 in the last paragraph, the second Catt Question is introduced. The essence of this question is the following problem. 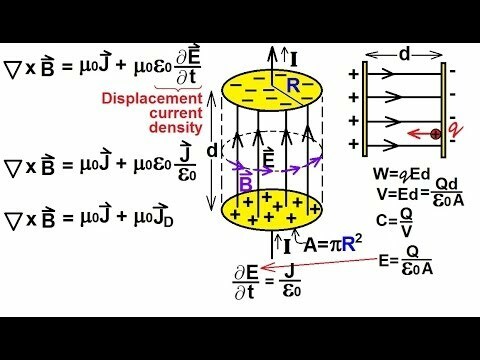 If the change in displacement field that occurs at the leading edge of a step function TEM wave creates a magnetic field, then this magnetic field violates the theory of the TEM wave, and so doesn’t this imply that the textbook conception of displacement current is false? To understand this better the reader should refer to the diagrams in this article. What Catt is saying is that the change in displacement as the TEM wave passes ought to create a lateral magnetic field, but we know that no such lateral field exists. 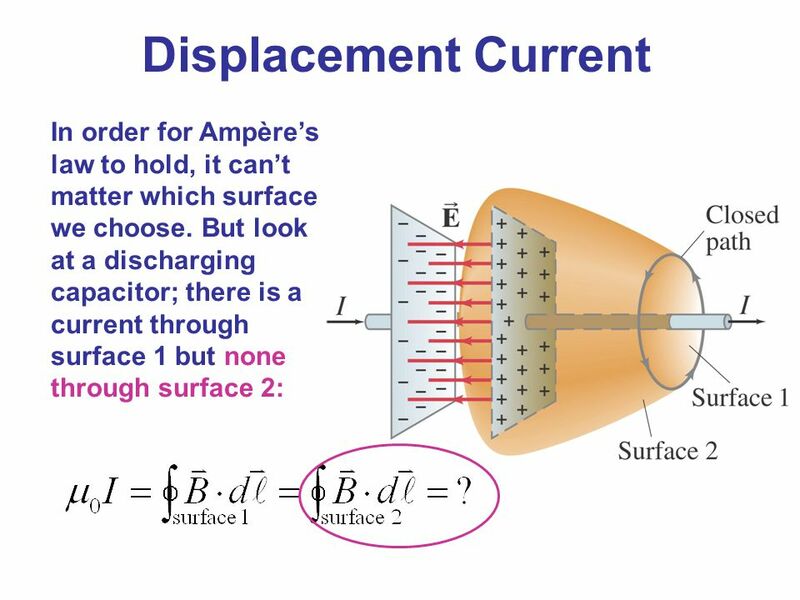 So this means that displacement current is a false concept. Put differently, according to the textbooks, the displacement current that occurs at the leading edge of a step produces a lateral magnetic field, however, there can be no lateral magnetic field in a TEM wave because there the magnetic and electric fields are transverse and not lateral fields. The second part of the argument is presented on page 43 where the conception that a capacitor is a transmission line is introduced and it is shown that there is a flow of conduction current laterally along the plates of the capacitor, and hence it is this conduction current that accounts for the presence of a magnetic field between the plates of the capacitor, and so displacement current is not responsible for the measured magnetic field as reported in experiments. In the second paragraph, we read that there is a problem because if dD/dt is regarded as a current, we have too much current, since then we have both a conduction current and the displacement current and so the current is counted twice. This last point has been a severe difficulty for the displacement current concept, since from the beginning, Maxwell was not clear about the difference between the two currents, and how they should be added or not added. This difficulty remains a major point of unresolved controversy in physics, as we will see in the next section. The reader is referred to A Revisiting of Scientific and Philosophical Perspectives on Maxwell’s Displacement Current by K.T. Selvan for a modern survey of the displacement current conception in physics. This survey gives a good overview of the recent controversies, but neglects to mention Catt’s arguments and also leaves out some other important critics of the displacement current conception. In particular he fails to mention Alfred O’Rahilly and his book Electromagnetic Theory, which gives a scathing criticism of displacement current. (See page 95) Hence it leaves the reader with the impression that the unresolved issues are minor and not fundamental flaws. The fundamental problem that is not addressed by the Selvan survey, is that the entire conception of the displacement current is ambiguous, and so its scientific value, and more important its conceptual meaning, is entirely unclear and hence controversial. 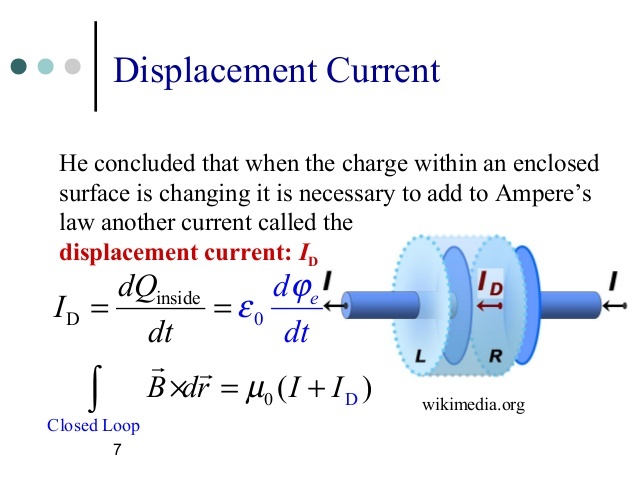 This aspect of the displacement current problem is discussed in the paper Maxwell and the Displacement Current by Alan F. Chalmers. Chalmers argues that the actual logical development of the displacement current concept by Maxwell is the opposite of what the textbooks say. “Thus a component must be added to the current so that the total current is no longer circuital, and this is just what Maxwell did in part 3 of his article, If this reconstruction is correct, then Maxwell’s reasoning was just about the opposite of the popular argument of physics textbooks mentioned earlier.” Chalmers is saying that displacement current was invented by Maxwell to account for why the current is not completely circuital, while the textbooks say the displacement current is needed to make the current circuital. Here we see why the invention of the Catt theory is an important innovation. It is obvious that significant and important innovations in scientific concepts are going to be resisted, but we need to realize that there is more involved than just a clarification of the displacement current. Catt and his coauthors argue that displacement current is unnecessary and can be dispensed with. The solution proposed was to treat the capacitor as an open ended transmission line and treat the problem using the theory of transmission lines. In this theory the open circuit transmission line builds up a charge in the capacitor as a result of reflections and the result is a standing wave of electric field that appears to be a static charge. The inflow of current during the energy accumulation or charging process being what textbooks call the displacement current. Is There a Difference Between Displacement Current and Real Current? The Selvan review of displacement current did not discuss an exchange of letters between Oleg Jeffimenko and John Roche that appeared in European Journal of Physics. This exchange summarises the essence or crux of the problem of displacement current. Jeffimenko pointed out that there is a difficulty in performing calculations of displacement current based upon the vector potential A, because you had to calculate the vector potential A from the displacement current, and that the displacement current was calculated from A. So the result was a chicken and egg problem of circular reasoning. The discussion did not reach a resolution, and that is unfortunate. The problem is that in the classical theory of electricity and magnetism, current is treated as a source of the fields. But, what is this current? It is assumed that current is a movement of electricity conceived as physical particles of charge. On the other hand, displacement current is supposed to be the source of the magnetic effect of a changing electric displacement. Since displacement is a measure of charge, then a changing displacement is effectively nothing but a different definition of a current. Which Current Is the Real Current? The problem of which of the currents, conduction or displacement, is actual current has a simple solution, but that solution is unacceptable to the majority of physicists, because it contradicts the long standing conception that current is a real motion of charge in the form of electrons. The solution that is proposed by Ivor Catt, Malcolm Davidson and David Walton is that all current is displacement current, and that all current has light speed, and so consists only of energy in the form of electricity as electromagnetic waves. Unfortunately, this solution is not obvious from reading what they say. However, it is inferred from the adoption of the Heaviside conception of an energy current. The difference here being that energy current is an awkward construction. This should be electromagnetic power, since a current of energy is power. 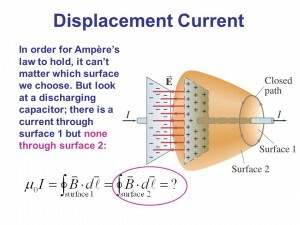 So what is displacement current? It is really nothing more than what we already call current, but that concept implies that there is a movement of electric charge in the form of charged particles called electrons. We can be pretty sure that the current that is assumed to be electrons is actually the displacement current of the electric field and that this current is actually what is measured by current meters. Ever since knowing that the electrons in a conductor travel very slowly I have considered that the current in electrons travelling at light speed is reduced from the actual electrons moving in the ratio of c/s where s is the electron drift velocity. Physicists might be able to assess the resistivity of the conductor as caused by the interaction of the electrons in the pathway between the atoms as if the electrons were a gas in the space between the atoms. I think the final suggestion really makes the concepts much clearer. Yes, the Mexican wave is a good example. We can regard rising people and moving electrons as motions of MATTER, and light wave or Mexican wave as motions of BEHAVIOR only.